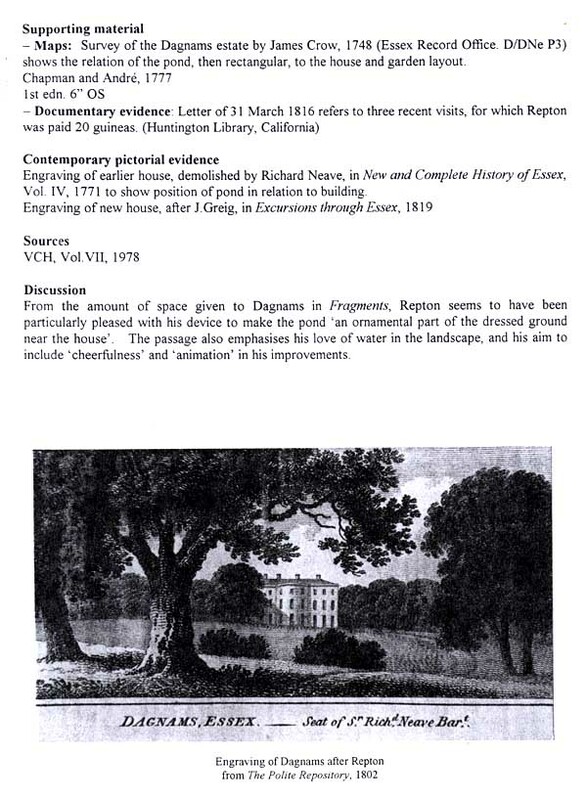 It is often stated that Humphry Repton landscaped Dagnams. It is by no means certain that he did. What is known is that he did designs for the pond near to the house (Lily Pond) There is no evidence that he did much more than that. All of his major works were usually detailed individually in a "Red Book" one for each contract. No Red Book exists for Dagnams. 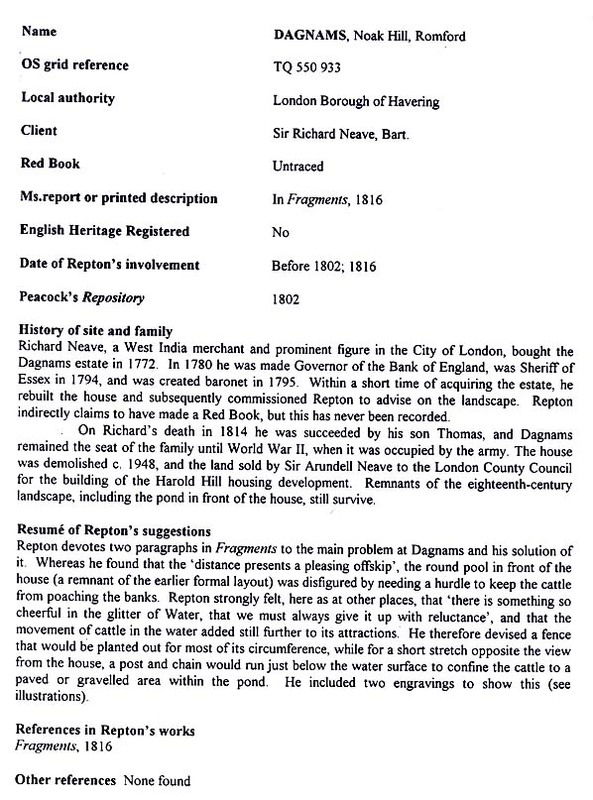 Below are references and notes from the illustrated work Repton in Essex it is the result of research undertaken by the Essex Gardens Trust with contributions from Georgina Green of the Woodford Historical Society and it is edited by Fiona Cowell. IT often happens that a piece of water, whether natural or artificial, forms the boundary of a pleasure-ground near a house, and makes an obvious line of separation betwixt the dressed or mown lawn and the park, or ground fed by cattle. But water is not a sufficient fence on all occasions; for, unless very deep, they will wade through it, and, however deep, deer will swim across. In some cases, as at "Woburn and Long-leate, a wall has been built of sufficient depth below the water-surface, to prevent animals from making good their landing: but in the winter this is no fence; and, while the ice remains, they must be either kept out by a temporary line of hurdles, or driven away into a different part of the park; otherwise, in one fatal night, a herd of deer, or a drove of bullocks, will destroy the produce of years in a shrubbery, pleasure-ground, or flower-garden. The following expedient occurred to me very recently, on considering the view from the windows at Dagenham, in Essex, a seat of Sir Thomas Neave, Bart. The landscape consists of a park, wooded sufficiently, and the distance presents a pleasing offskip; but the most conspicuous feature is a large circular pond, or pool, with naked banks, from which the cattle are excluded by a hurdle, to prevent their poaching the clay shores. The sight of this hurdle is very offensive; but it is rendered doubly so, by being reflected in the water, where it becomes still more conspicuous by its opposition to the sky. It has long been matter of doubt and difference of opinion, whether it would not be advisable to drain off the water, and make a dry valley or dell, of this unsightly pool which, from its situation, reflects nothing but the sky. Yet there is something so cheerful in the glitter of water, that we must always give it up with reluctance, however ill-placed, or badly shaped; it was, therefore, decided to preserve this pool and to make it an ornamental part of the dressed ground near the house. In the stiff clay soil of Essex, there is great objection to admitting cattle to tread down, or poach, the margin of a piece of water so near and immediately opposite to the windows ; yet, to exclude them entirely from the pool, would he to rob the water of the most interesting features of which such a pool is capable, viz. the reflection of moving objects on its banks, and the glitter of its surface when put in motion. 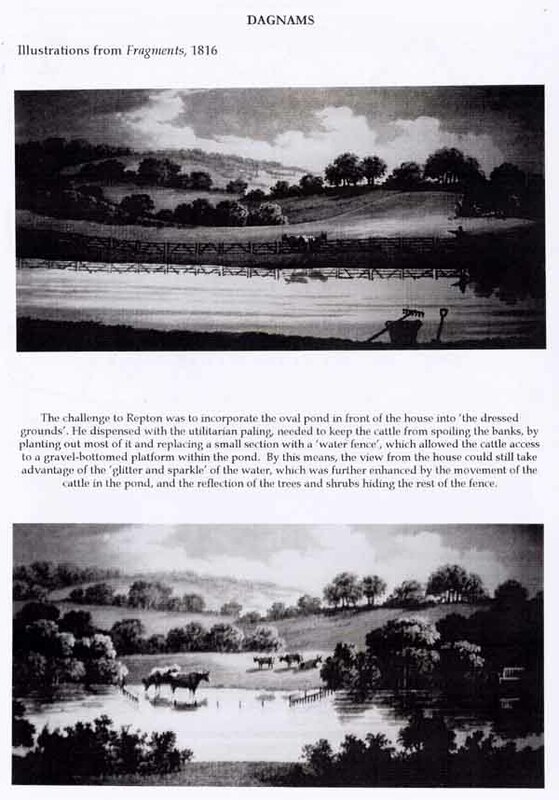 Add to this, if cattle can be kept from browsing the boughs which overhang the water, there is nothing more interesting than the contrast made by dark foliage reflected and opposed to those parts of the margin which reflect only the sky. An attempt is made, in the annexed plates [figs. 237 and 238], to represent this effect, which also shews the present appearance of the pool, where no objects are reflected except the sky and the line of hurdles [fig. 237]. To realize this landscape, it is proposed to fence the opposite bank of the pool by such a line of paling as may sweep round the thickets of thorns, and alders, and brushwood, by which they will be concealed, and then a post and chain should sweep into the pool, just below the surface of the water, admitting cattle to stand on a bank, which should be gravelled, or paved, to prevent their sinking into the soil, and discolouring the water.